The academic alternative to Wikipedia! Provides access to nearly 500 encyclopedias and dictionaries. Search by concept map. Includes thousands of searchable images. Online version of the multi-volume set that provides scholarly biographies of important people in all walks of American life. Information on people from throughout history, around the world, and across all disciplines and subject areas. Includes content from dozens of published reference works and hundreds of periodicals. Offers the in-depth, original profiles from the Current Biography and World Authors series, the thorough periodical coverage of Biography Index and the specialist biographical content of Junior Authors & Illustrators. It provides biographical full-text articles, page images and abstracts from today’s leading magazines and journals. This database offers a collection of full-text biographies and unique narrative biographies. Including coverage for several of the most popular and heavily-researched biographies and genres, including those contained within Biography Today and Biography (both dating back to the first issue published). Provides comprehensive life histories for each of the 716+ species of birds breeding in the USA (including Hawaii) and Canada. Includes the complete texts of almost 300 encyclopedias, dictionaries, handbooks, and other reference works from Wiley Blackwell Publishing in the Wiley Blackwell Reference Online collection. Also contains description-only citations of over 21,000 other online books, journals and articles. Brill's Encyclopedia of China (see also www.brill.nl/encyclopediachina ) is a convenient reference on China from its early beginnings, with a clear focus on the modern period from the mid-nineteenth century to the 21st century. Arranged in alphabetical order, it covers the history, geography, society, economy, politics, science, and culture of China. All contributions are written by an international team of European, Asian, Australian and American experts, carefully selected from a wide spectrum of academic disciplines. A general encyclopedia covering a large range of topics. A collection of specialized reference works. A survey of the history of Western thought and culture that explores the origin, cultural interpretations, and historical themes of such subjects as beauty, love, feminism, diversity, and social capital, among many others. Experts from various disciplines examine major developments in intellectual history during the past 30 years reflecting all aspects of knowledge from a global and gender-inclusive perspective, allowing readers to trace ideas and concepts across culture and time periods. Current, online version of the famous dictionary. 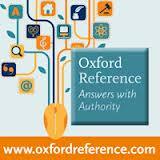 Contains the complete texts of over 100 Oxford University Press dictionaries, encyclopedias, and other reference titles. Overview essays on American popular culture by decade from 1900s through 2000s. For each decade includes sections on Architecture and Housing; Books and Literature; Business, Advertising, and Consumer Culture; Clothing, Fashion, and Appearance; Film; Food and Drink; Music; Performing Arts and Theater; Recreation and Leisure; Sports; Technology and Media; Television and Radio; Transportation and Travel; and Visual Arts.